Our vet, the affable Dr Mouhli came calling on Saturday morning. As our animals are registered with the établissement départemental d’élevage, an organisation that is charged with ensuring the traceability of farm animals, we automatically receive communications from the Directions Départementales des Services Vétérinaires concerning our responsibilities and animal welfare. We have to nominate a local vet, in our case Hamadi Mouhli, and he is also informed by the DDSV which holdings he must call on to carry out testing or vaccinations. We were thus expecting the phone call from Annick, his secretary, to make an appointment for a three-yearly blood test to detect the presence or absence of brucellosis in our flock and to vaccinate our sheep against blue tongue. As I’ve mentioned before on these pages, in order to get these important vaccinations produced and rolled out across the country, the use-the-whole-bottle-the-day-it’s-opened flasks come in an inconvenient size of 100 doses. This provides our vet and his secretary with an additional logistical task of matching up larger farms with small flocks like ours to get the most out of each bottle. 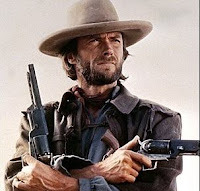 With a multi-dose syringe in each hand (our sheep were receiving annual boosters for both serotypes 1 and 8) and counting out glass phials for the blood tests as if he was loading up with cartridges, he had a certain air of Clint Eastwood about him. Finding a vein under a winter woollen coat wasn’t the easiest of tasks and we were amazed to see how easily the wool came away as he plucked it—much as you’d pluck a chicken—to give him a better chance of hitting the mark. It made us wonder whether we shouldn’t try plucking our sheep this May, rather than shearing them! One of our ewes gave us her answer yesterday morning—see the photo at top. Yet another boy: now in our forth year of keeping sheep, we’ve only ever had male lambs. 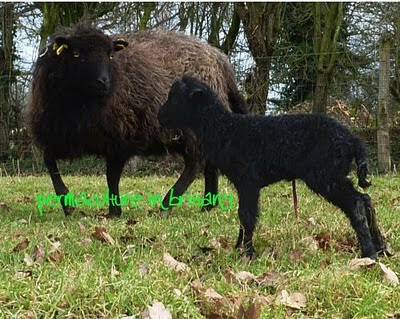 We don’t habitually name our animals here, even the cats don’t have names, but as the first lamb of 2010 and born on St Valentine’s Day, we’ve decided to call him Valentin. He heralds the start of our lambing season, or as it’s called in French, l’agnelage (agneau is French for lamb). Ahh, your post brings back warm, happy memories of all-night lambing stints back in England. 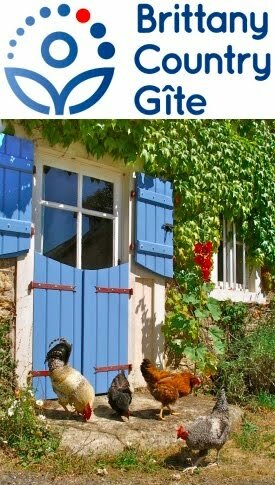 I am so pleased that I have found your blog (through A Taste of Garlic site) One of my dreams is to build a little cob/strawbale cottage here in France and live sustainably. I shall be back.